Hey there! Thanks for dropping by Cindy Lee Gray's Blog! Take a look around and grab the RSS feed to stay updated. See you around! Inspired? Makin’ it Happen? Yes, Not Yet! 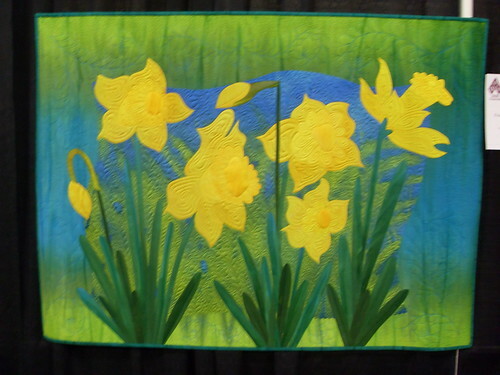 A few weeks ago I was able to sneak away and attend the AQS Quilt show at the Opryland Hotel in Nashville. It had been a couple of years since I made this show. I was very pleased to find an exhibit by the “Chicago School of Fusing“. I’ve enjoyed the work of a couple of the founding faculty members, Melody Johnson and Laura Wasilowski, for a long time. 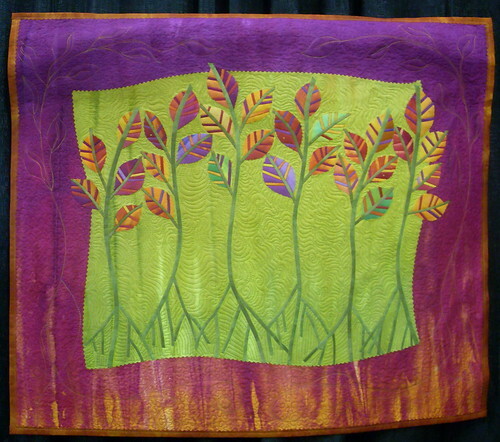 I always vistied and bought their hand-dyed fabric and other wares at their ArtFabrik booth at the quilt show in Paducah. Laura and Melody were always alot of fun with wonderfully sarcastic senses of humor. These quilts were made by Frieda Anderson another CSOF faculty member. They are equally stunning from a distance and close-up. 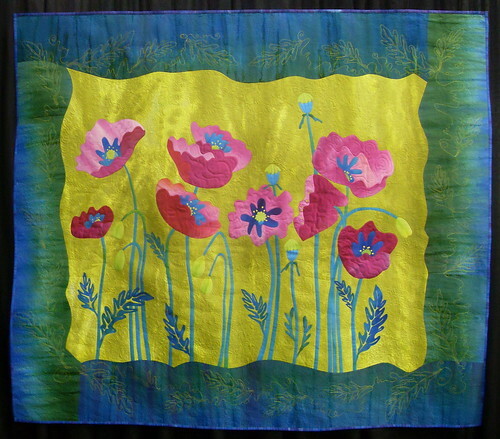 Make sure to visit the link above to see more quilts, more pictures, her blog, her inspiration, etc. Of course there were vendors galore, and I made some contributions buying patterns, a few packs of fabrics, a couple of tools and gizmos. I was really looking for some fun, quick projects. I hope to turn some of this inspiration into some actual “works” soon! And as I think about it, inspiration is not my problem. I’ve always said I’ve got a hyperactive mind, but just not the body to go with it. The problem is “getting it done and producing results”. I guess that could be a topic for a whole “nuther” blog. I have been sewing a little bit this week, and if I’d get away from this computer, I might get a project done! 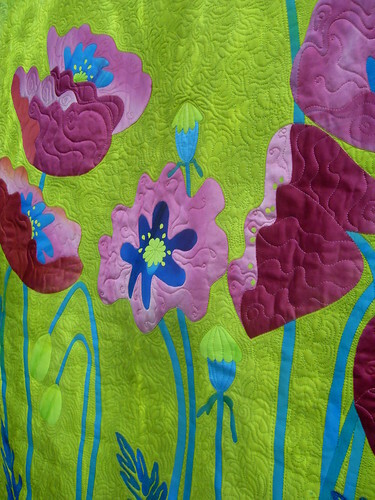 WOW, those quilts are cool…..of course, they’re made by some Chicago chicks, so would you expect anything less?? LMAO! WOW, what amazing work. Thanks for sharing those photos. Maybe one day I’ll get to do that show with you. I’d love to see all the quilts. Wow, very cool. So much detail. The closest I’ve ever come to making a quilt is a blanket where you cut and tie. lol. Yeah, not even close. Beautiful. 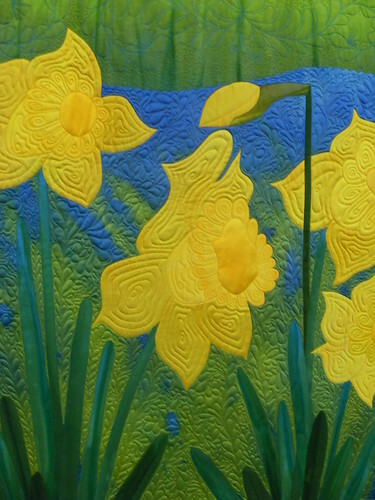 I see why these quilts inspire you. They’re so beautiful. They kinda give you an ache to create something just as beautiful yourself. Kinda like the song or movie you wish you had written. 🙂 When you do get inspired my birthday is July 2 and I love blue.